BUILD Pizzeria Roma CLOSED 2286 Shattuck Ave./Bancroft, downtown, (510) 898-1839. L-D daily; $$. No reservations. This is the first pizzeria in Northern California to allow you to customize your own gourmet Roman-style pizza. Servers provide a number to take to the pizza-building cafeteria line where you tell the pie-maker which organic, locally sourced toppings you would like. You’ll see crusts being tossed in the air and completed pies being placed in the two high-heat wood-fired ovens--at 800 to 1,000 degrees pies bake in under three minutes. I ordered what turned out to be a red pizza with the rosso tomato sauce base and toppings that included uncured nitrate-free pepperoni and sweet little red piquante peppers as well as mushrooms, marinated artichoke hearts, and plenty of whole roasted-garlic cloves. The cost is determined by how many toppings you choose. I also built a delicious veggie-laden salad with a Caesar dressing. A full bar serves up cocktails, and local wines and beers are on tap—including my favorite Berkeley-made Trumer Pils. Dessert selection is also simple—a soft-serve sundae swirled high with Strauss organic ice cream plus a side of housemade topping (I was very pleased with vanilla and butterscotch), or a budino butterscotch pudding served in a cute little Mason jar. High ceilings and some repurposed fixtures accented with clean lines and huge black-and-white photo murals depicting the ‘60s provide a contemporary Italian feel, and silent TVS and pulsating music form the background. Plan ahead and you can tie this in with a movie at the U.A. Berkeley 7 theater just a few doors down. Best Western Plus Palm Court Hotel 234 D St., downtown, (800) 780-7234, (530) 753-7100. 3 stories, 27 rooms. Children free. Fitness room; hot tub; steam room. Coffee and biscotti breakfast; restaurant. No pets. Free underground parking. 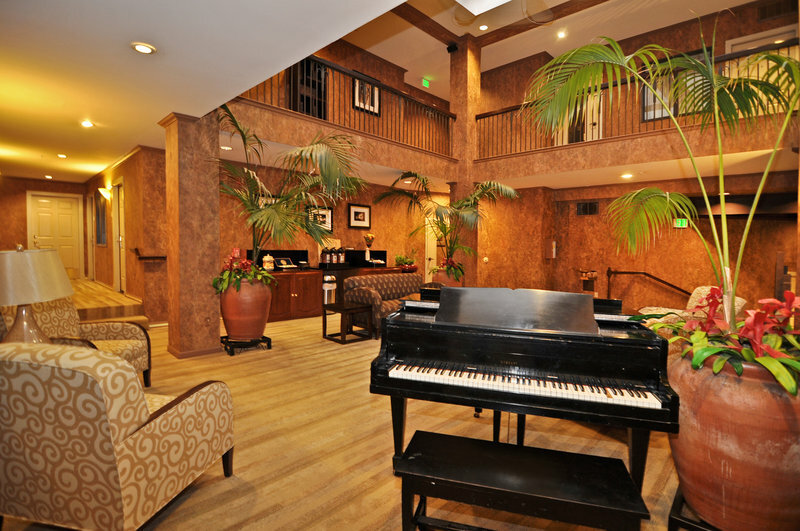 Well-situated in the thick of the town’s shops and restaurants, this attractive and comfortable all-suite hotel has a pleasant atrium lobby. Cafe Bernardo is two restaurants in one—with a full-service venue and also a more casual area where diners order at a counter. Comfortable for a meal at any time of day, you’ll find big lattes as well as sandwiches and pastas. Across the hotel lobby, Bar Bernardo is famous for its Wicky Wacky Woo cocktail. Hattie Weber Museum 445 C St., in Central Park, (530) 758-5637. W & Sat 10-4. Free. Named for the first paid librarian in 1910 Davisville, this small museum features exhibits on the history of Davis and the surrounding area. It operates within a 1911 library building that became the first branch of the Yolo County Free Library and was moved here in 1988. "Beat Memories: The Photographs of Allen Ginsberg" just opened at the Contemporary Jewish Museum for a run through September 8. Ginsberg wrote poetic captions that appear in his handwriting under the photos. The exhibit is enhanced by a room where you can hear a recording of Ginsberg reading from several of his poems. Among the special programs related to the show is a mini music festival focusing on interpretations of Bob Dylan's "Highway 61" (Ginsberg had a sort of father-son relationship with Dylan). Yolo County SPCA Thrift Store 920 Third St./I St., (530) 758-0544. Daily 10am-7pm. Located across the tracks, this charity store offers bargain prices on just about everything you can imagine. Donations are accepted--even used and broken electronics. Davis Farmers Market 3rd/C sts., in Central Park, (530) 756-1695. Sat 10am-1pm & W 2-6pm. Founded by four U.C. Davis students in 1976, this is the state’s first certified farmers’ market. The extravaganza overflows an open-air area covered with a high awning (it is the only farmers market in California with its own covered pavilion). In addition to fresh produce and flowers, it features prepared food and related crafts. Take time for a snack or lunch of tamales, hot dogs, or Indian fare and “naanwiches.” I made an inexpensive lunch out of two samosas with a delicious cilantro-coconut green sauce from Kathmandu Kitchen, and sat down for a while to enjoy it at a picnic table sheltered by mature trees. Nice handmade wicker shopping baskets are for sale at a good price at the market’s kiosk, which also sells popular logo items. Owner Lachu Moorjani is again exploring new paths with a Chef’s Tasting Menu. I visited recently to sample the vegetarian menu ($24) (a non-vegetarian menu ($27) is also available). Note that it is a requirement that everyone at the table order the same dinner. Our spread began with complimentary papadam lentil wafers and mint-cilantro sauce. Then came fleshy portobello mushrooms with a delicate sauce of cashews, cilantro, mint, tamarind, and yogurt. Tandoori asparagus arrived with a low-key sour cream-cashew sauce. And then came our last appetizer--a vegetable samosa stuffed with potatoes and fresh peas and a side of cilantro sauce topped with tamarind. At this point things revved up, and our entrees arrived all at once: Navrattan korma (seven different vegetables in a rich creamy curry sauce with nuts and paneer); khumb jahanara (a mix of shitake mushrooms spiced with onions, tomatoes, garlic, ginger cashew paste, coriander, cardamom, and cloves); bheh kofta balls (formed from lotus roots, potatoes, breadcrumbs, and spices and served in an orange-colored sauce of onions, garlic, tomatoes, yogurt, cashews, and more spices); and our hands-down favorite—red and smoky achari baingan (eggplant in a highly spiced sauce composed of tomatoes, ginger, garlic, and Indian pickling spices). Surprisingly, we had room for dessert, which was a choice of pistachio kulfi, exotic and refreshing cardamom gelato, mangoey mango sorbet, and the best gulab jamun I’ve ever had—swimming in a honey sauce. Ajanta will celebrate its 20th birthday in June. Expect some surprises. US Bicycling Hall of Fame 303 3rd St./B St. W 4-8, Sat 10-2. $5, 60+ & 6-12 $3. This small three-level museum serves as an educational and research center for all aspects of cycling and bicycle history. The approximately 135 inductees are honored on the second floor (about four more are added each year), where you can view awards, jerseys, and bikes—including Eric Heiden’s unusual team time trial bike featuring spokes covered by Mylar for aerodynamic efficiency. In the basement are the don't-misses. It is where Green Day once performed a concert. Additionally, the Pierce Miller antique bicycle collection includes a six-seat tandem bike and an assortment of unusual children’s bikes (the oldest item dates from 1823), and you’ll also see a folding parachute bike from WWII. Casa Soberanes Adobe 336 Pacific St./Del Monte Ave. This circa 1842 adobe features thick walls, interconnecting rooms, and a cantilevered balcony as well as a lovely garden. You can visit the garden, but the house is closed because of earthquake damage. Armadillo Music 205 F St., (530) 758-8058. Gently used LPs, CDs, and DVDs are waiting in this tiny shop to find new homes. Items are guaranteed against defect, and you are invited to bring in your own used music items to sell. Live music occurs randomly in-store. 2nd Friday ArtAbout 6-9pm. Free. This monthly evening event features open galleries, artist receptions, and refreshments. ●The Artery 207 G St., 530-758-8330. M-Thur 10-6; Fri 10-9; Sun 12-5. This artists’ co-op, which features fine arts and contemporary crafts, is especially abuzz during ArtAbout but is a great place to visit any time. Look for unusual baskets from Jeanne Oster and Japanese fish prints from Christopher M. Dewees. Dominated by the U.C. campus, this pleasant rural college town is famous for its bicycle paths and inexpensive ethnic restaurants. Davis was the first city in the U.S. to have bike lanes throughout the city and now has more than 100 miles of paths and lanes. Biking is probably so popular here because the land is flat and the climate mild. It is estimated that there are more than 60,000 bicycles in use in Davis--making it second only to China in bicycle use. Impressive sculpture dots the campus--including five “Egghead” pieces by Robert Arneson--and downtown has art galleries, coffeehouses, and restaurants galore. Bikes can be rented in several downtown shops. Whether you find yourself in need of a complete breakfast or just coffee-and, stop in at any of these reliable spots. Most open at around 7 a.m. Then, properly refueled, at around 10 a.m. you can head out to a morning of shopping or sightseeing. Emporio Rulli Caffè at Union Square On Union Square/Stockton St., (415) 433-1122. Daily 7am-7pm; $. The menu is simple: hot drinks and Italian pastries in the morning, wines and beers and sandwiches in the afternoon. My favorite is a coffee au lait with a kipfen—a puff pastry confection stuffed with almond paste. Some seating is available inside, and plenty more is scattered outside on the square. The other seven . . .